Apocalyptica in Montreal or Quebec City? Inform me about the next events for Apocalyptica. Enroll yourself to our priority waiting list for Apocalyptica to be alerted when new tickets are available. Filling this form doesn't engage you to any purchase. 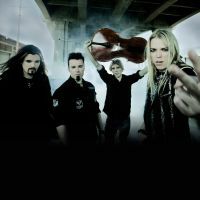 Apocalyptica will be performing in Montreal, at the Metropolis, on March 10th, 2011. The concert was originally scheduled for December 2nd, 2010, but the whole North-American tour had to be postponed due to cello player Perttu Kivilaakso's health issues.